Forest Green have offered Yan Klukowski a new contract but the midfielder has yet to decide his future. The 27-year-old became the club's top all-time Conference goal scorer on Tuesday night, breaking Alex Meechan's previous record of 46. His two goals in the 2-1 win at Macclesfield moved his tally to 13 for the season, but he has yet to commit to Rovers beyond the summer. "When the season's finished I'll sit down with the gaffer," said Klukowski. "I love Forest Green, I've dedicated my life to this club. "But I haven't played in the Football League and I need to give myself the opportunity and explore those options. "If I sign for next year I'll be delighted. If if doesn't quite work out then we'll see where it takes me. At the moment it's just hinging on talks with the gaffer." Chippenham-born Klukowski has scored 48 goals in four seasons at the New Lawn. And manager Ady Pennock says the midfielder fully deserves the praise he has received for achieving the club record. "It's fantastic. 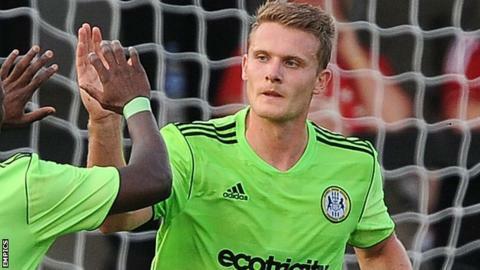 He's a genuinely nice fella and a very good footballer," Pennock told BBC Gloucestershire. "For a midfielder to score as many as he has for this club, he deserves all the accolades he gets. "A month into my tenure I offered him a contract but he wants to see if there are any other League clubs out there, which is fair enough. "I want to keep him but if a League club does come in for him then fair play, he deserves it."